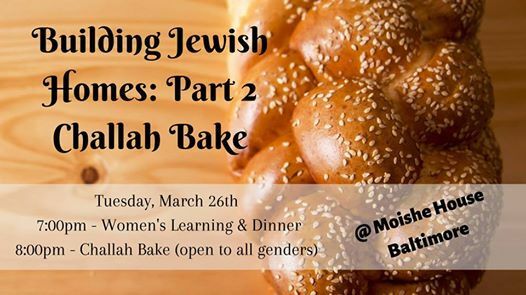 We are thrilled to host Chana Grove, director of Etz Chaim's JCare Fellowship and an amazing mentor to young Jewish professionals, to join Moishe House for a women's learning session and an all-gender challah baking class! You will not only leave with new knowledge and new friends, but also your own loaf of Chana's challah and a reusable challah cover. 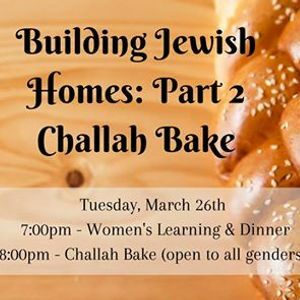 Don't miss out on the opportunity to incorporate challah into your Jewish home! Moishe House is an international non-profit organization that focuses on creating vibrant communities for all Jewish young adults in their 20's. Located in Canton, Baltimore, the Baltimore Moishe House hosts tons of awesome events all month long-- 7+ to be exact! We strive to build a welcoming and inclusive "home". Come check us out!